I have been trying to get a group of folks to do this run literally every weekend this year. 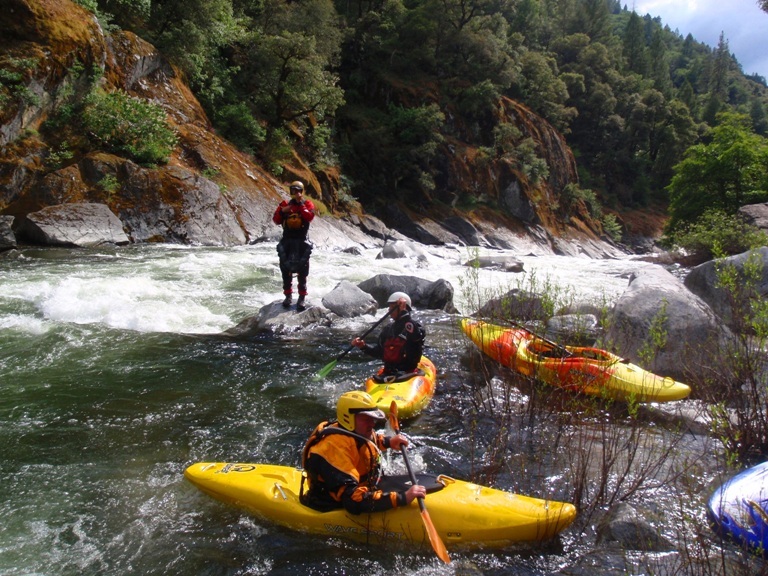 But as every weekend approached, my friends had one excuse or another, South Yuba releases, not wanting to do a long shuttle, high water etc. 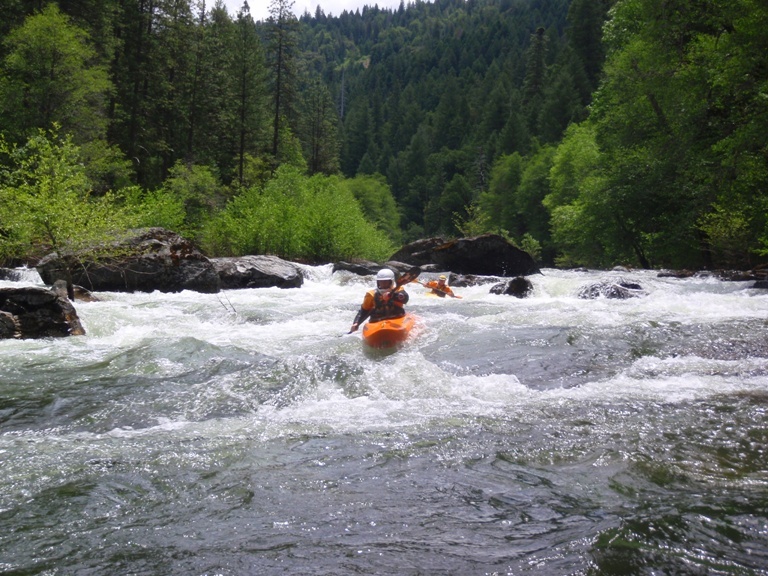 As the spring closed and summer began I had given up, when by shear luck, while planning a different weekend, a friend asked if I wanted to do this run. I jumped at the chance (actually I had to be convinced since I have several level-snob friends who said the level was way too low to be worth while, but I ignored them after much deliberation and signed on to the trip). This run really was one of the more scenic runs I have been on. The last three miles are up there with all the most scenic runs in the state, Burnt Ranch, 49 to Bridgeport, Giant Gap etc. Grey granite overlaid with red, brown, and yellow mosses/grasses offer an interesting contrast to the bright and dark greens of the forest behind. It is truly a beautiful place that I will surely return to. The river itself is interesting. 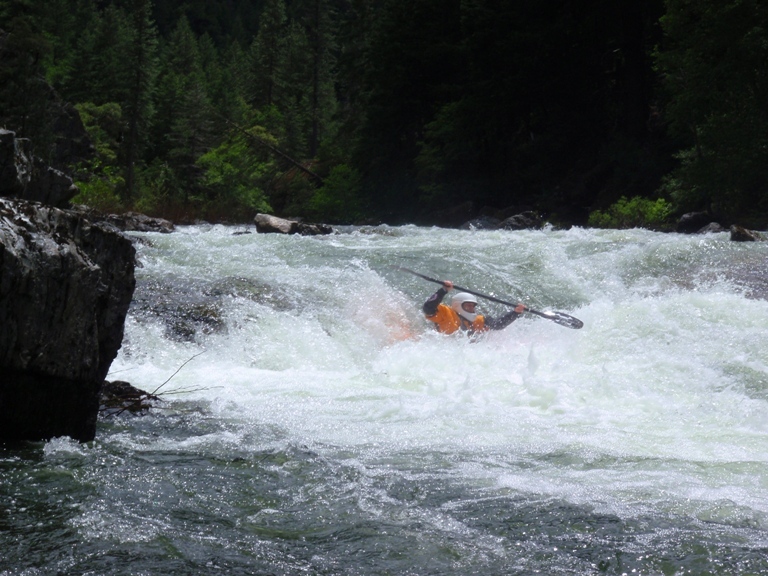 We had 750 cfs, only 50 cfs over Stanley and Holbek’s minimum level. It starts off with some class III-IV with one bigger rapid that I can imagine turning into IV+ or even V- at higher flows. 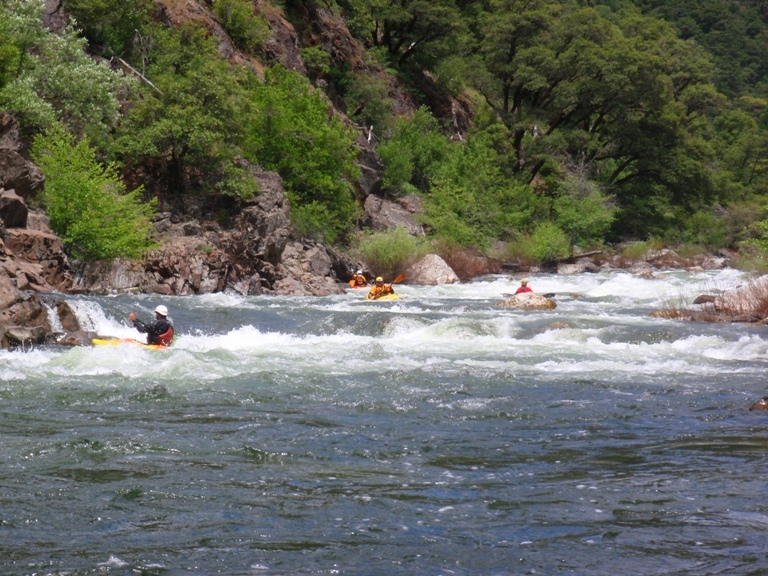 After about a mile, the river eases up and you have 10 miles of moving water, mostly class II with an occasional class III or very easy IV. Those miles go by quick even at the low flows thanks to the consistent gradient. Less than two hours after putting on we were taking a lunch break just above what turned out to be the final gorge. From here, the pace slowed dramatically. In the eleventh mile, you will notice a sudden character change. 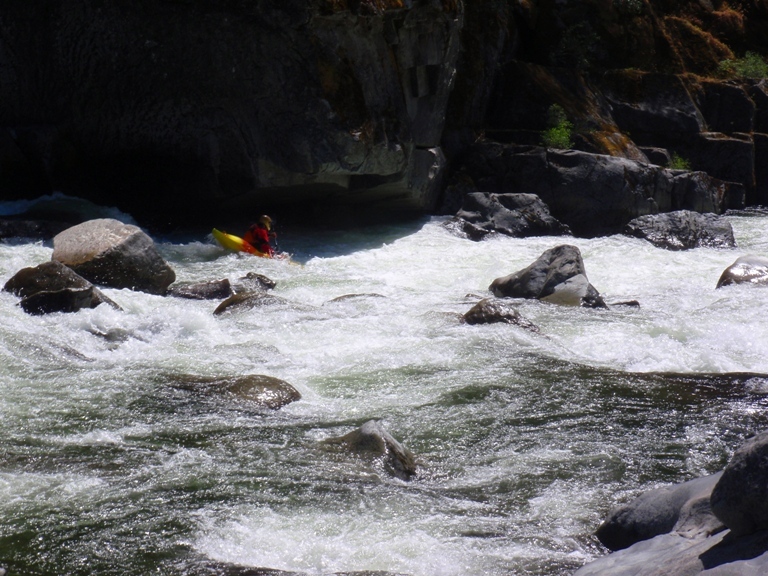 The river develops granite walls, some bed rock appears and the rapids quickly get harder. At the low flows I would say most were class IV to IV+. 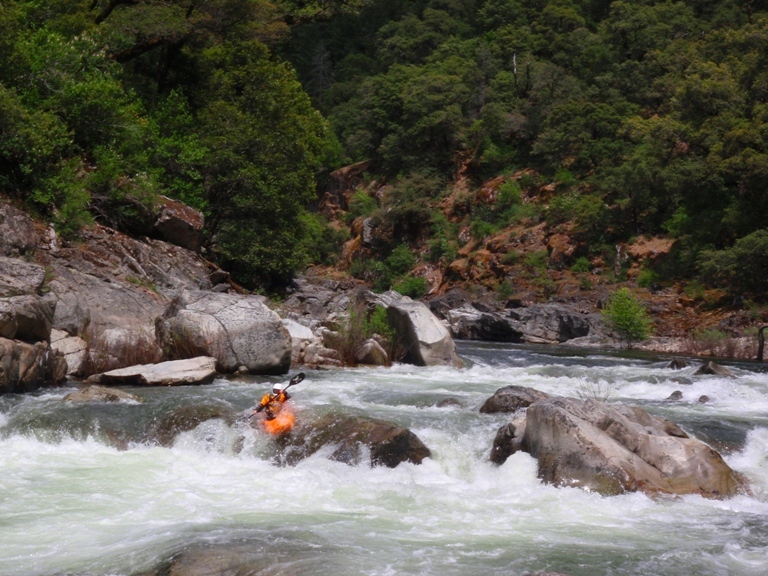 Pre-Falls and Mokelumne Falls are essentially one rapid even at the low flows and deserve a class V rating. We had a class IV boater with us who walked 5 or 6 times. At the low flows the walks were not difficult, however as the flows come up the scout and walk of Pre-Falls and Falls becomes substantially harder, and I mean substantially. At the low flows you could portage Pre-Falls on the left, ferry in front of an undercut and portage the Falls on the right. 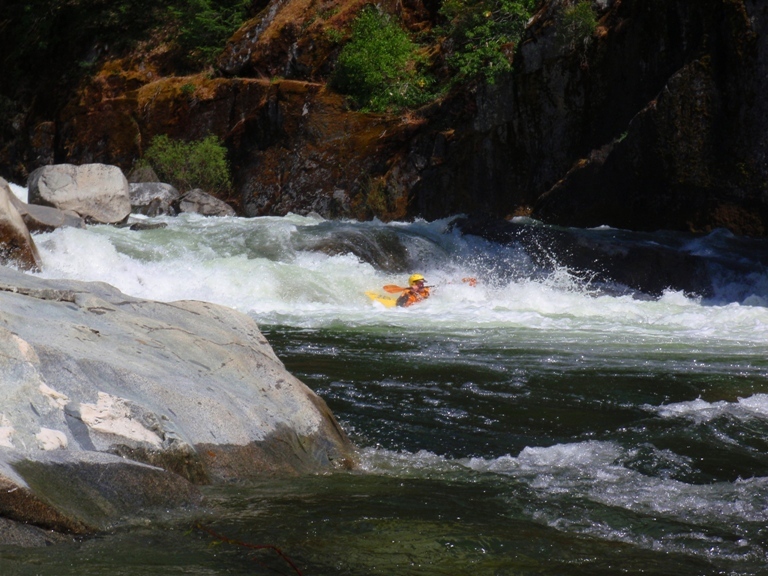 I have been told that at high flows you are forced into running the Pre-Falls before catching the micro eddy above the Falls if a portage or scout is inclined. So although the book says 700 is the minimum flow, I know cacreeks has the minimum for IKs down near 450. I would say 450 would be a bit boney for hardshells but could see it still being enjoyable down near 600. 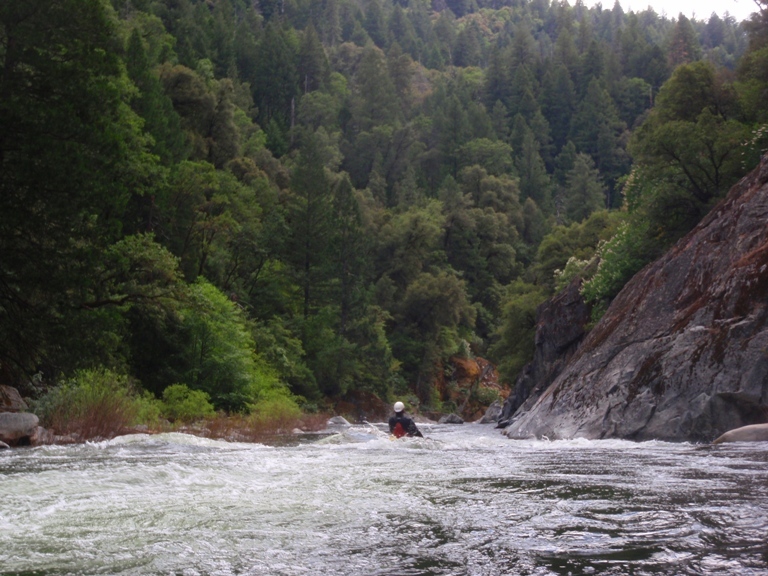 There is camping everywhere on this stretch of river, an overnight is a great prospect for low water runs. 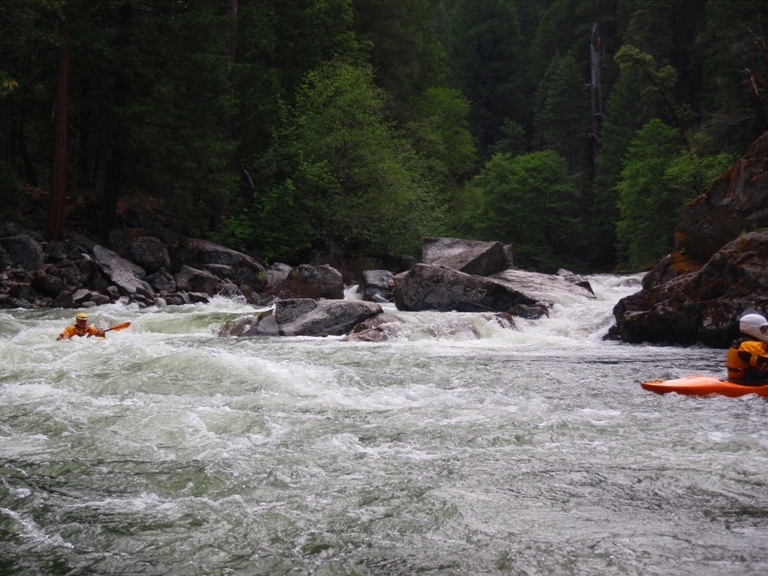 At those lower flows I would however imagine some of the rapids may become a bit rocky and necessitate a portage. I have also been told that while 1,800 was a fun flow, 2,100 seemed noticeably scarier. One final thing, on your first time down, plan for a long day. The final gorge will almost certainly require 5-6 scouts due to long or blind drops. Most groups take out fairly late their first time. Stories of groups camping out unexpectedly or paddling up to take-out as the sun sets are not rare. We met at 9:30 at take-out, put on by 11:00, and were off at 5:00. We could have skimmed an hour off of our run by not lingering at scouts for pictures but that still would have been a long day, so plan accordingly. 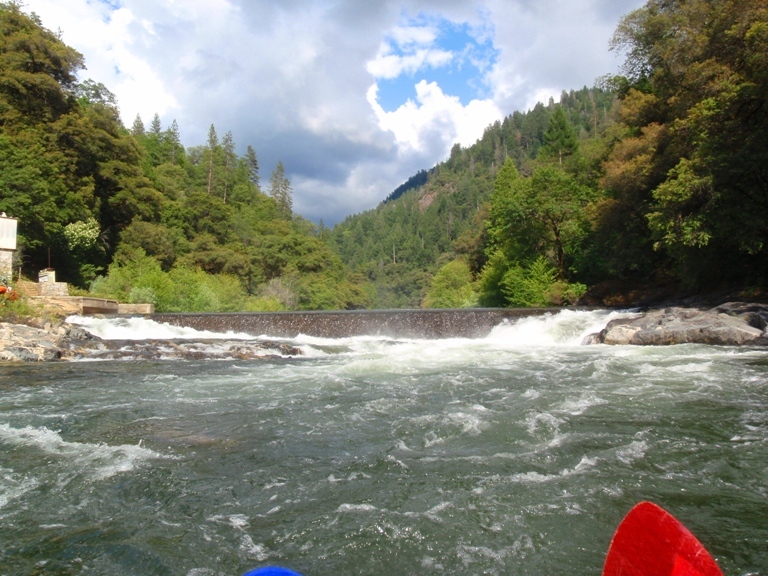 If you would like to visit the group's website that is fighting to protect the North Mokelumne from future dams as well as getting it classified as Wild and Scenic, please go to Foothill Conservancy's webpage. Thanks. The first mile is steep and very fun. 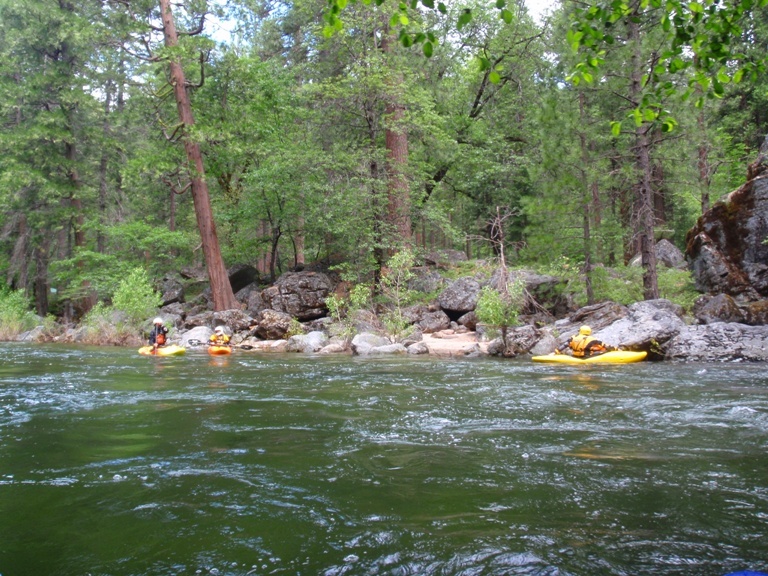 You don’t get a warm as the first class III+ to IV- rapid is 100 yards downstream. Zig-Zag (III+). We went right then left then right. There were a few clean lines and a few not so clean lines. Big One (IV). With more water I could see this becoming IV+. It starts off with a five to six foot ledge into a good size holes. 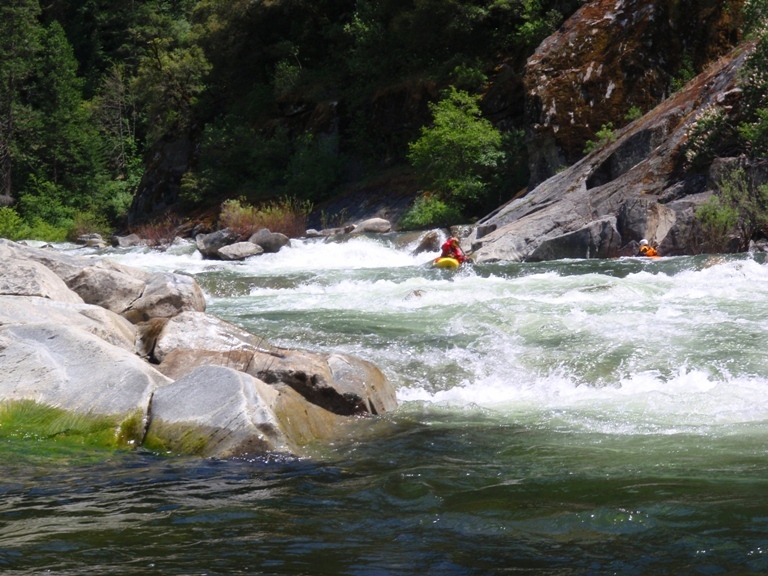 The river then pushes into several rocks to be avoided by going through holes. The run-out last for about 100 feet. Cascade (IV). A straight away leads to a cascade that we ran down the left of center. There were a few large holes on the far left as well as a large on in the middle. There was also a boof on the far right near the undercut. End of It (III-). 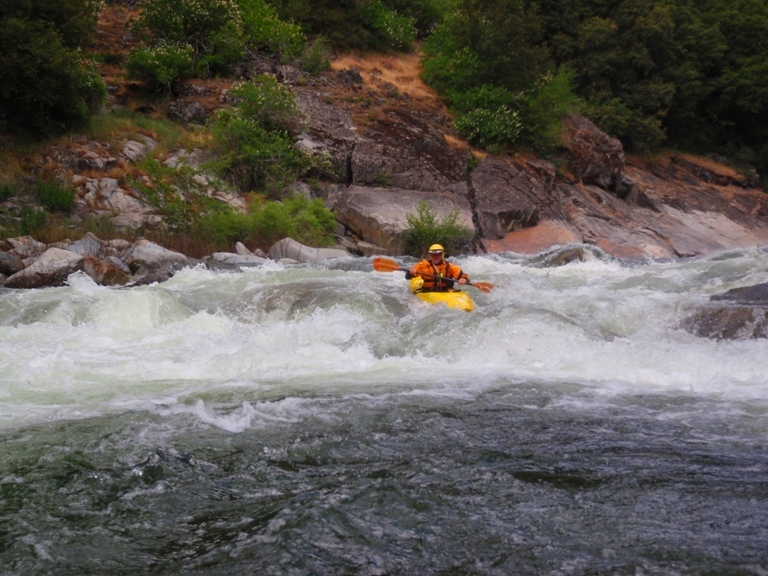 There was one more rapid that I remember that was a rocky rapid that ended in a fence. 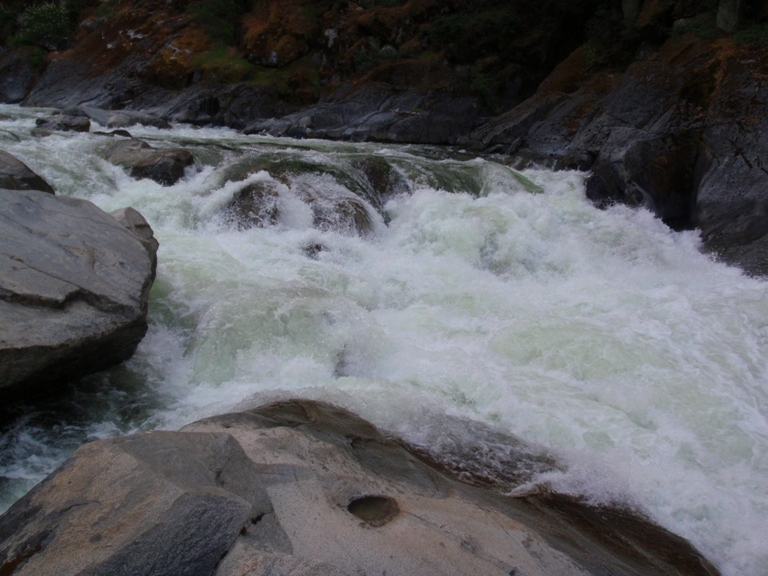 With more water this rapid would turn into waves. 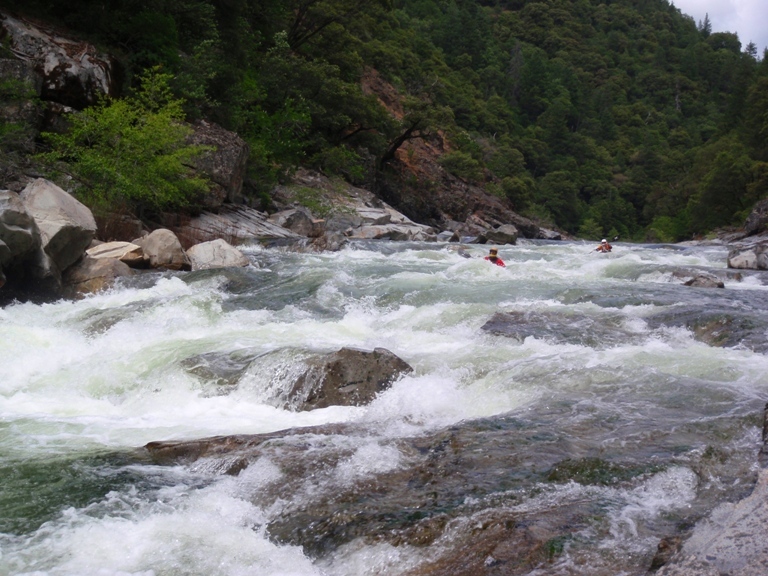 Rapids ease for the next 10 miles. There are occasional larger drops evenly spaced in the miles. 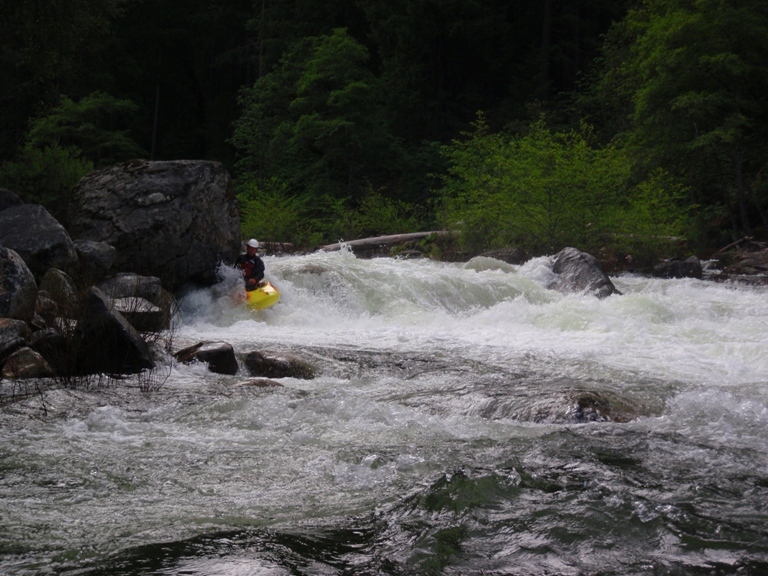 Once the rapids start coming in quicker succession you know you are almost to the final gorge. Slide (III+ to IV). Just at the end of the fourth mile, you get to a nice steep drop. We ran onto the pillow in the middle and went down the slide into the hole below. Ledge (IV- to IV+). 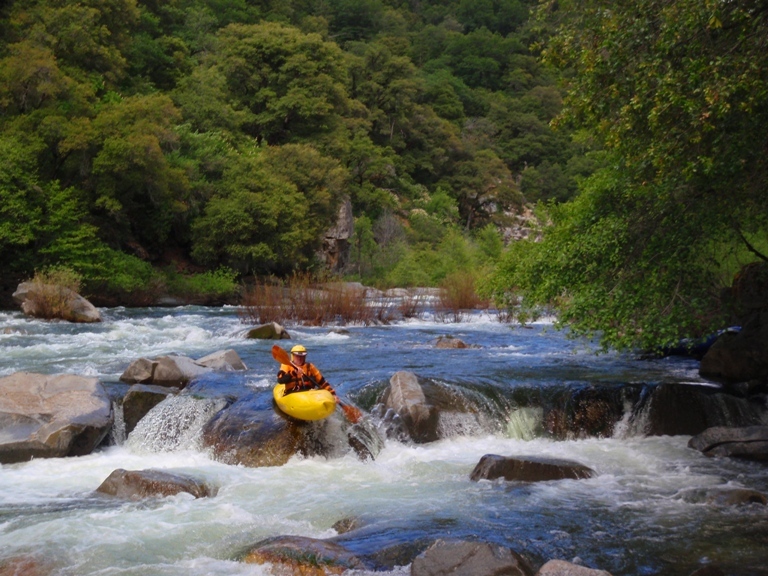 A river wide reversal that might entail a walk at higher flows. At our flow we were able to skirt it on the very far left. As water comes up there is a small window that opens up in the middle as well. 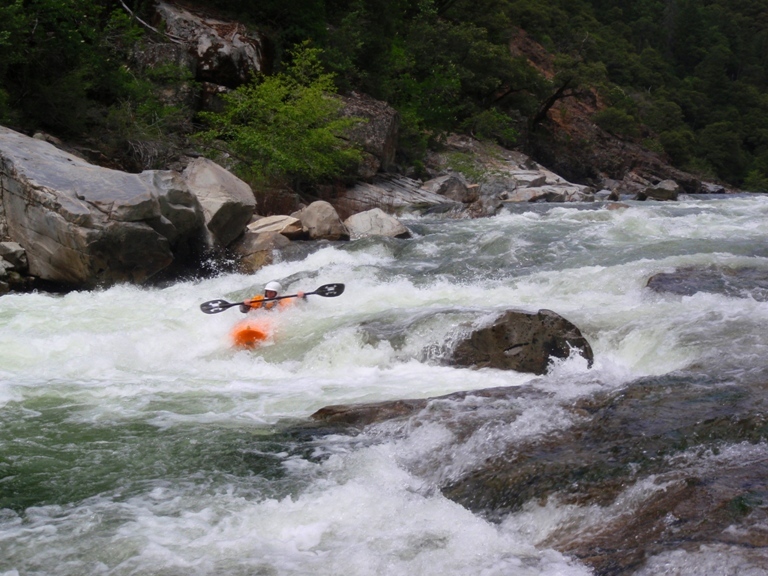 Long Drop (III+ to IV). A long drop picks up in excitement and then curves left and drops into a few more holes. Whoops (IV- to IV). 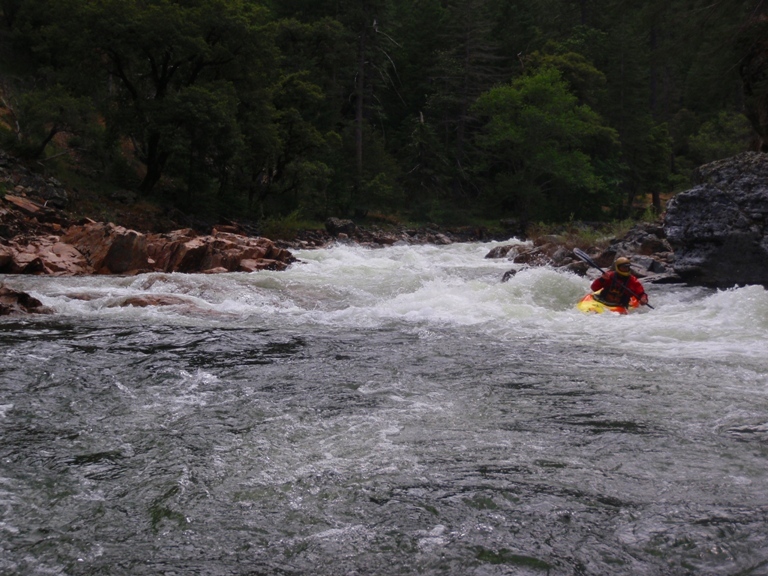 This rapid started to get bigger just as I committed to running it. Luckily, the bottom turned out to have an opening. 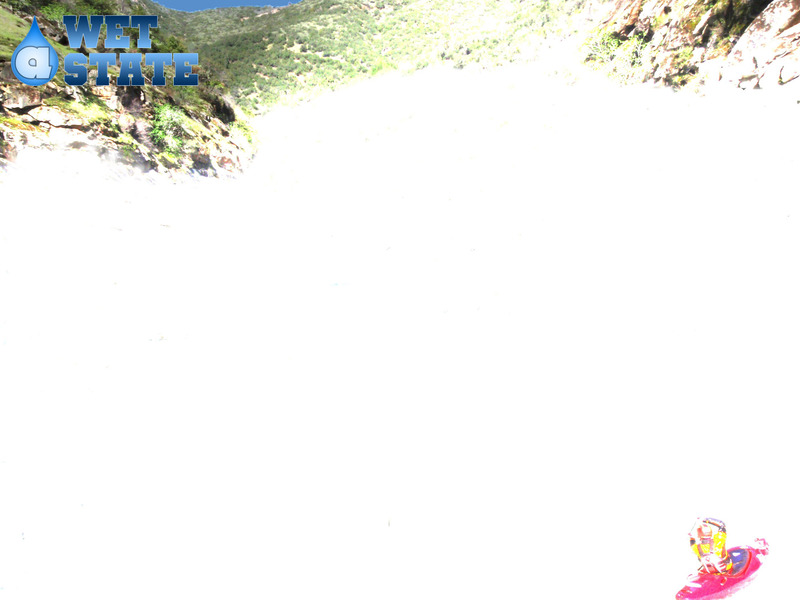 It is a steep cascade that is shallow and has several holes. We ran down the right of center. 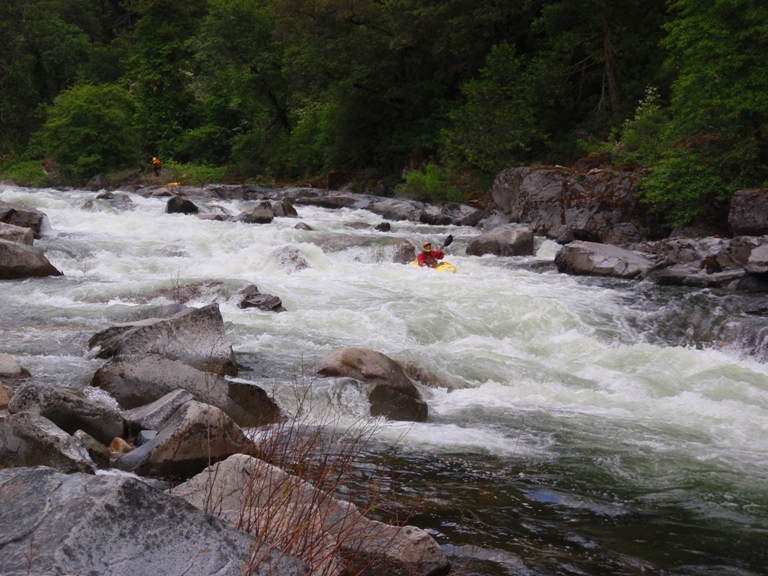 Granite appears and a few easier class III+ and IV- rapids appear. Ledge at the Bottom (IV). A zig-zag lead in brings you to a ledge. We ran center. 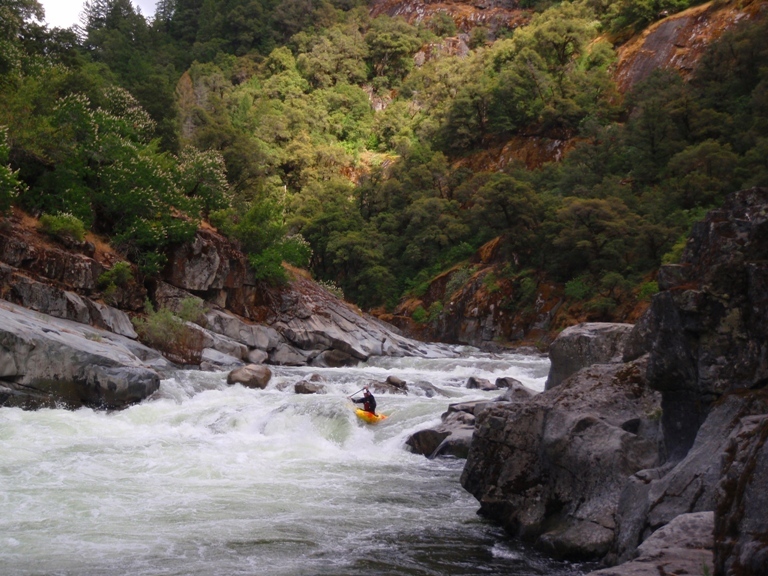 Just downstream is another ledge that can be run on either side of the rock. At higher flows this might have a large hole. Ledge (III+). A straight forward move that you don’t want to mess up. Just boof the rock in the middle. Scout right. Just Around the Corner (IV). 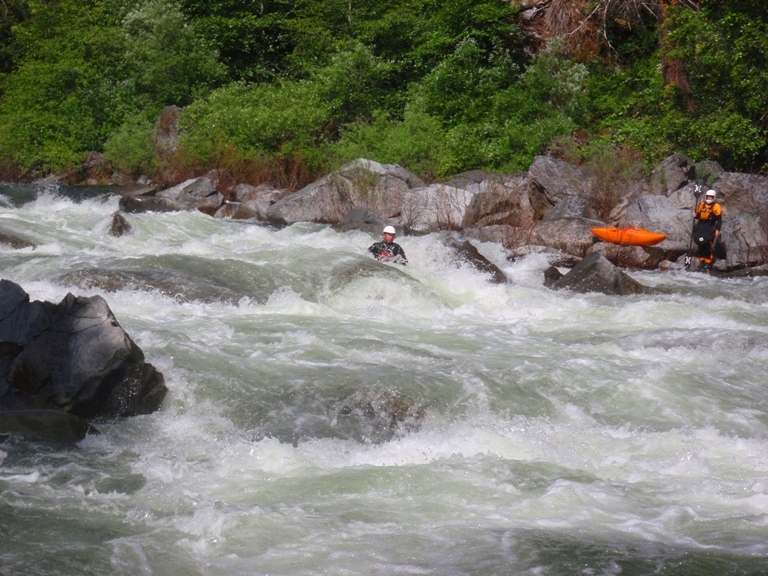 A long rapid is just around the corner. Several ledge down the right lead to a rock fence and a larger ledge. We ran right then center in the rocks and then through the ledge below. S-Turn (IV-). 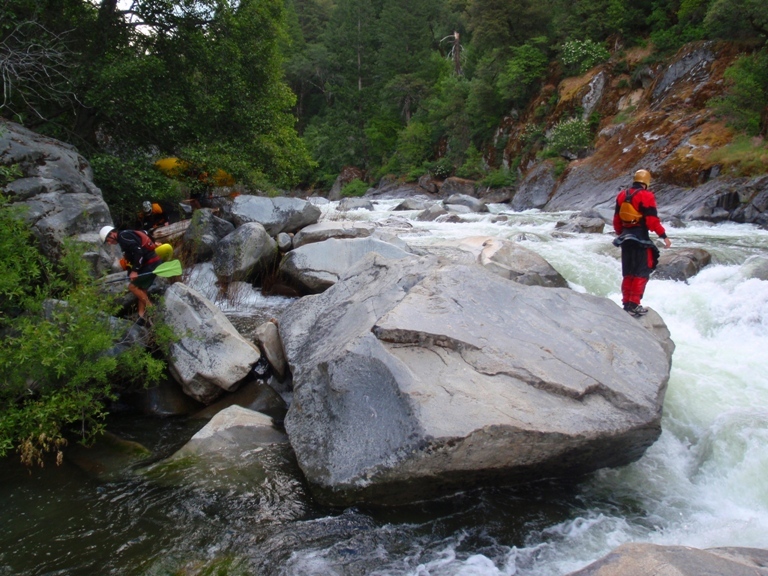 A junky rapid we ran around the left side of the rocks in the middle of the river. Ledge But Bigger (IV to IV+). The lead in takes you left towards the huge undercut and sieves. The center had a tree sticking up in a crack. The right was too shallow. 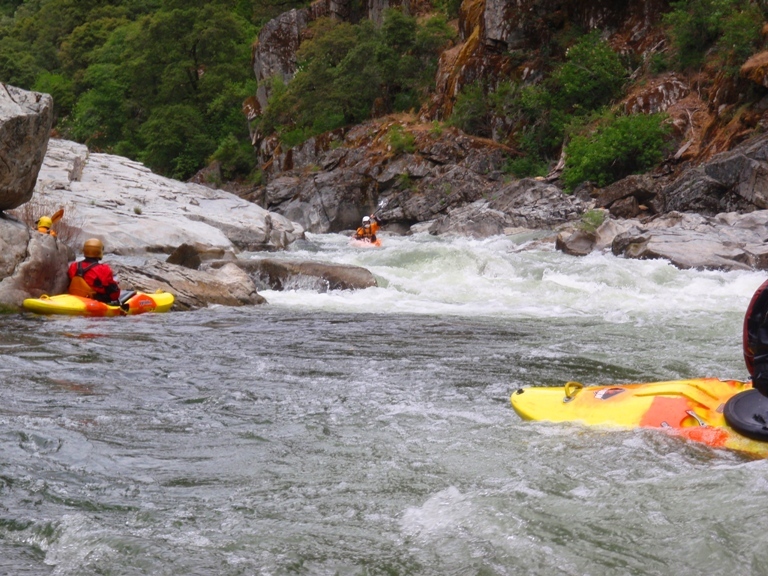 We ran down the center, cut right and either boofed the midstream rock or drove onto the pillow and over it landing in the hole below. Some also eddied out on the left to ferry to the right for the pillow. We scouted on the right. Easy walk if so inclined. Three Tiers (IV+ to V). At low flows the hydraulics weren’t bad and there was time between each tier so I would call it IV+. At higher flows I would imagine the hole with each tier would get bigger and the water would pile harder into the rocks in the middle of the current in each tier. We ran center, either center or left, and then left. The second tier had a rock shelf to boof off of center or a hole on the left to punch through. Cascade But Bigger (IV to IV+). Straight forward but not the place to mess up. We boofed in on the left and then drove straight down the middle threading the needle between some rocks. Easy scout on the left. Holes (IV to IV+). I think the scout from the right was better. I scouted left. I missed the boof off the nose rock, went deep. Then straightened out for the large hole backed up by a rock and then drove right to avoid the worst of the bottom hole. Rocks and Holes (III+ to IV). It gets more gorged up, we rand down the left of center. 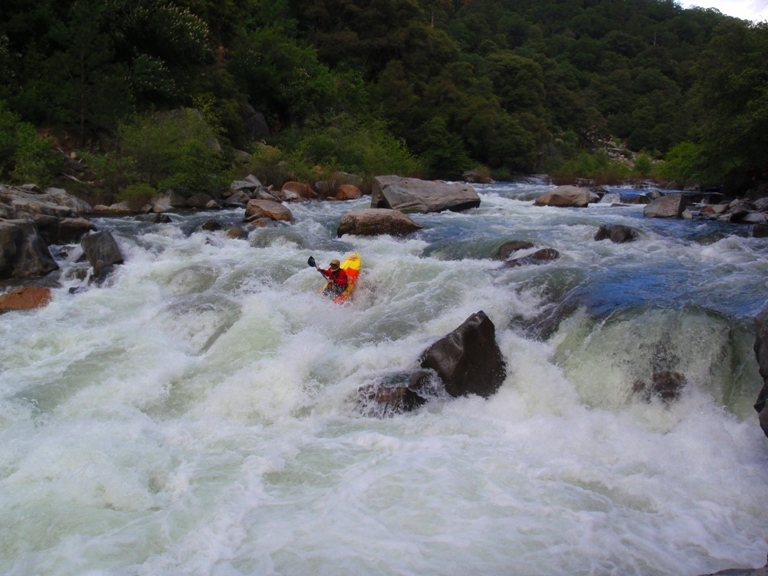 Pre-Falls (IV+ to V). 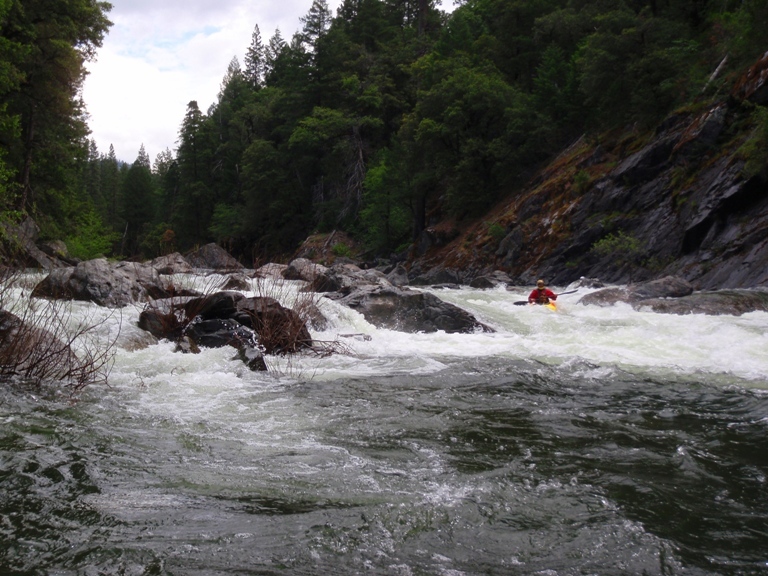 Even at our flow this rapid was basically just the entrance to Mokelumne Falls. There was only 50 feet of strong moving water between the two. Not the place to make mistakes. 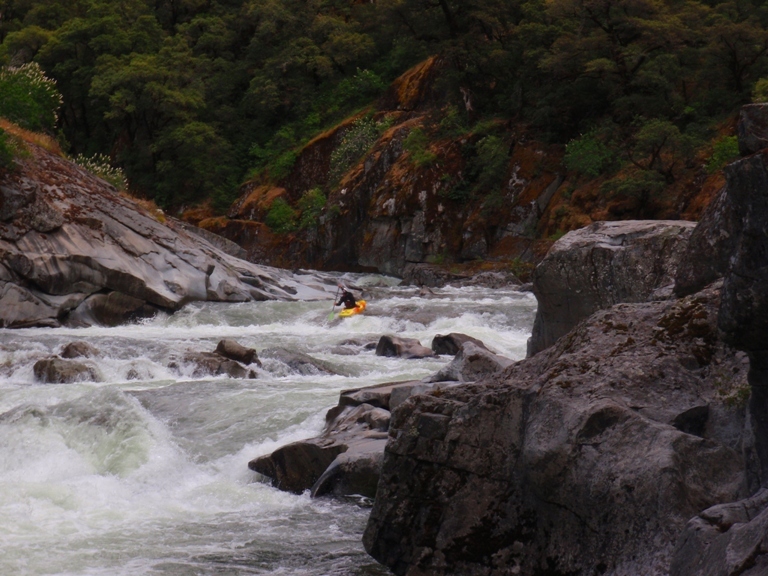 To make matters worse the scout is hard and the walk is impossible at high flows. 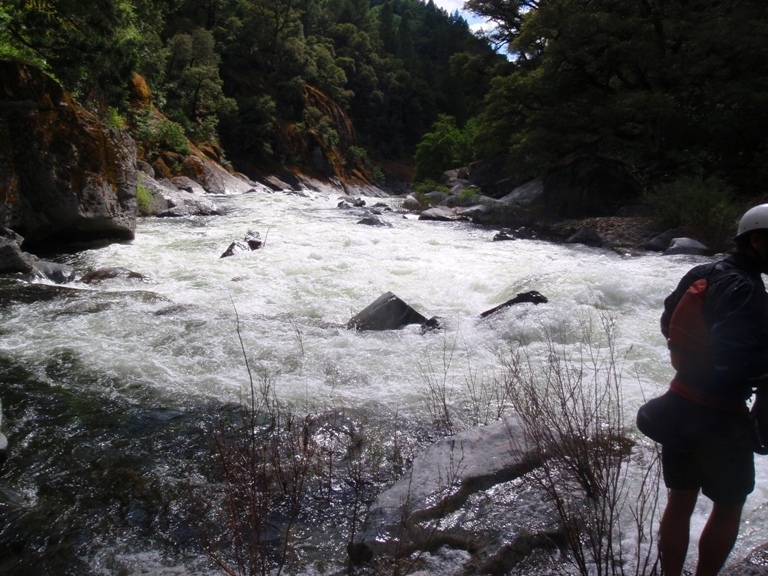 At our flows you could walk the Pre-Falls and ferry across the right to the right to scout or portage the Falls itself. The line was down the gut and avoid the hole. As flows come up the hole gets big. 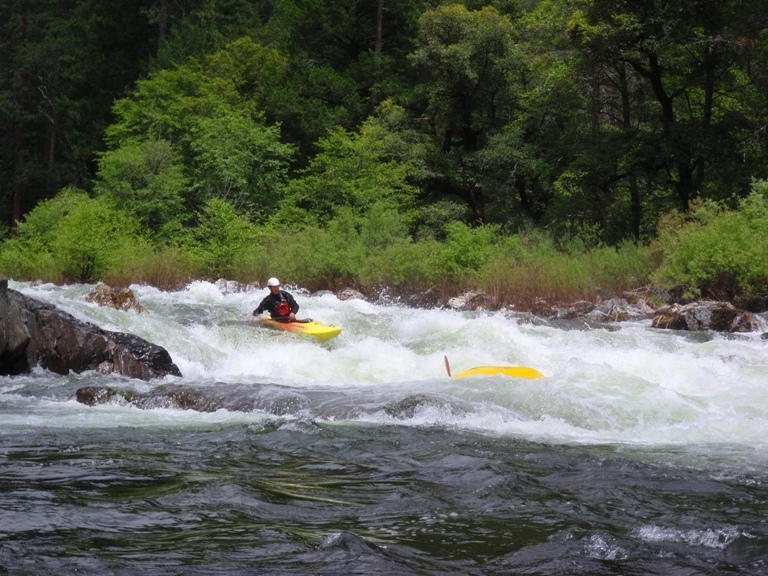 Mokelumne Falls (V). Junky everywhere, but there is a small window on the right between the rocks. 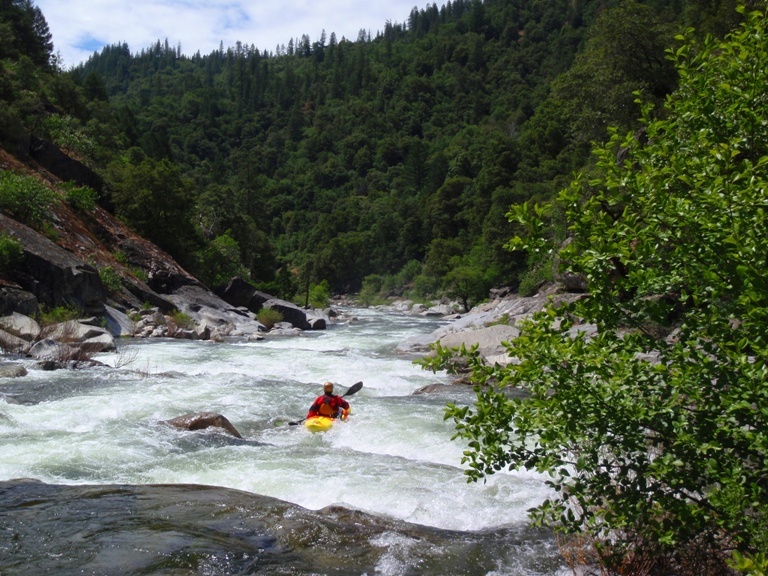 If you find yourself running it without scouting be far far right and drive slightly left as you start cascading. Scout on the left and portage there if so inclined. Dam (IV+ to V-). 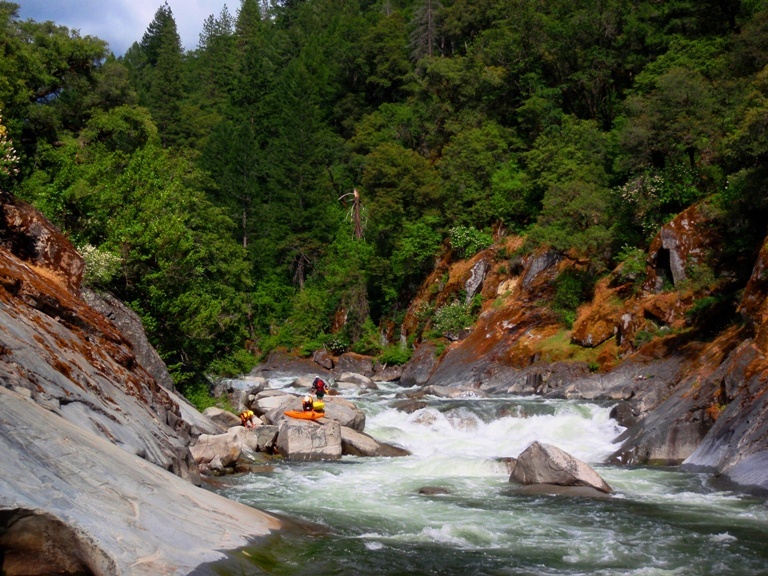 You can portage easily on the right or run the far left where the water goes up on the bed rock creating a neat slide into a ledge drop. 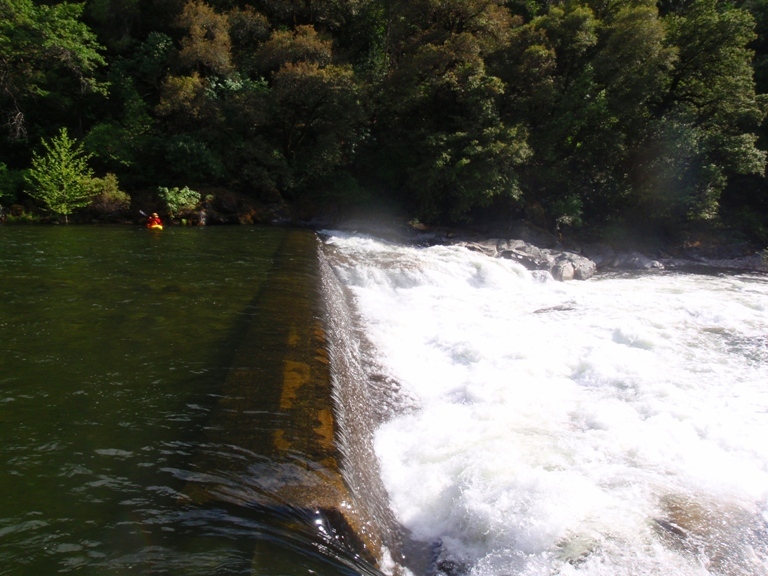 Tiger Creek After-bay is within site from the dam. 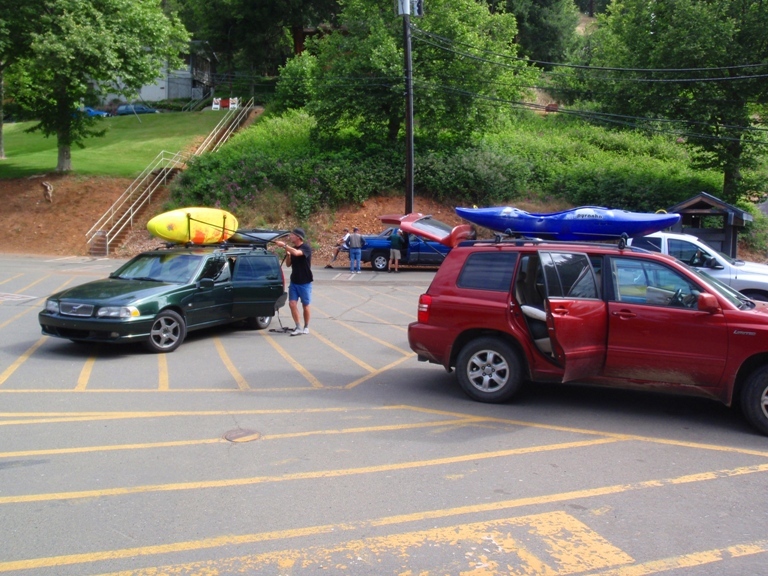 You only have to paddle a hundred feet of slack water to where the picnic area is. Take-out: From Jackson proceed East on Highway 88. 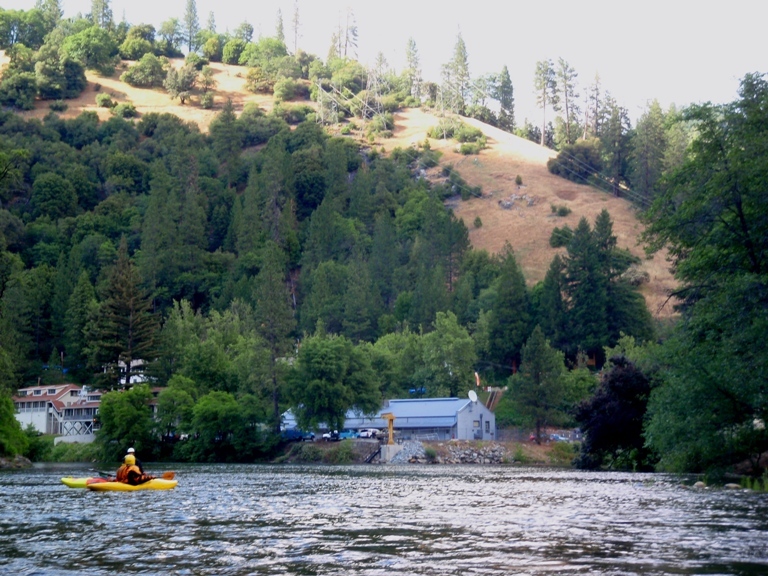 Go through the town of Pioneer and look for the Buckhorn lodge on your right after about 2 miles. 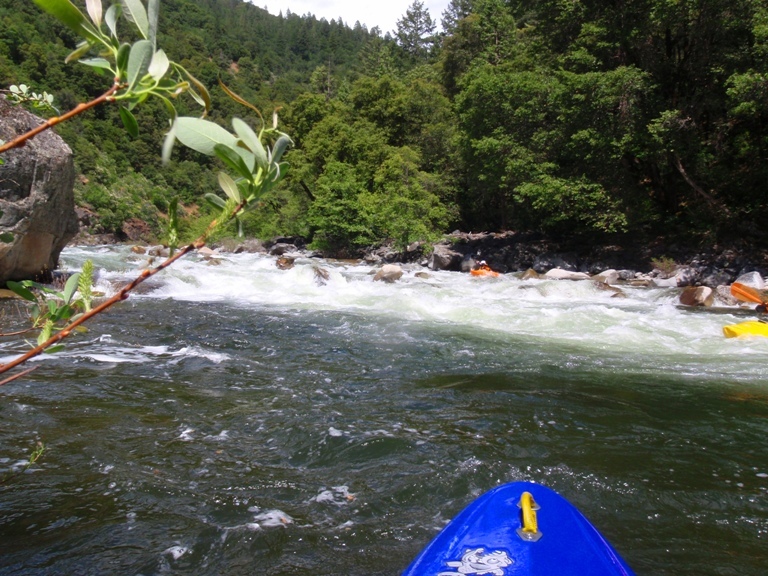 Just past it 50 feet there is a right turn for Tiger Creek After-bay or Mokelumne River or something to that affect, I don’t actually recall. The road name is Tiger Creek Road though there is a misleading sign that makes you think it might be Wagon Wheel Road or something to that affect. 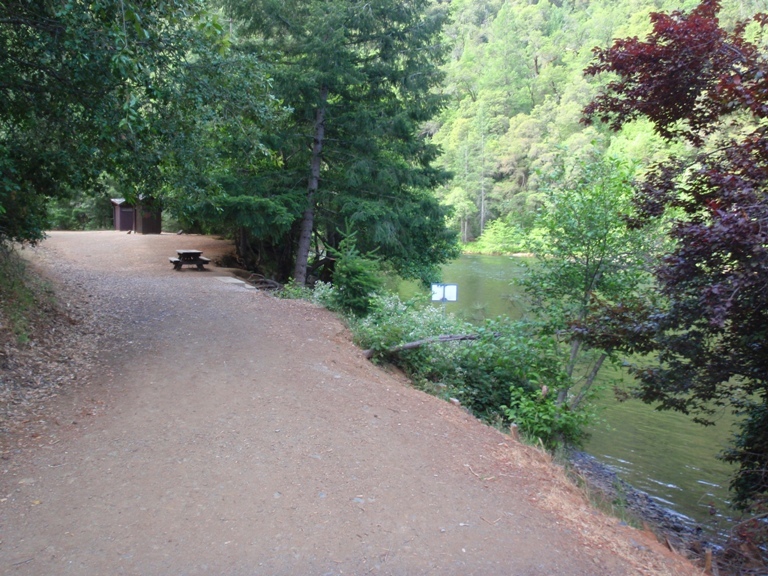 Follow the road all the way down to the power station and park in a recreational user parking spot. Put-in: Go back up the road 100 yards from the Powerhouse, head upriver using the road that is usually paved but occasionally dirt. Follow it for 20 some odd miles. You will cross Tiger Creek itself after a few miles. You will then see the divert canal follow the road. Stay on the main road. 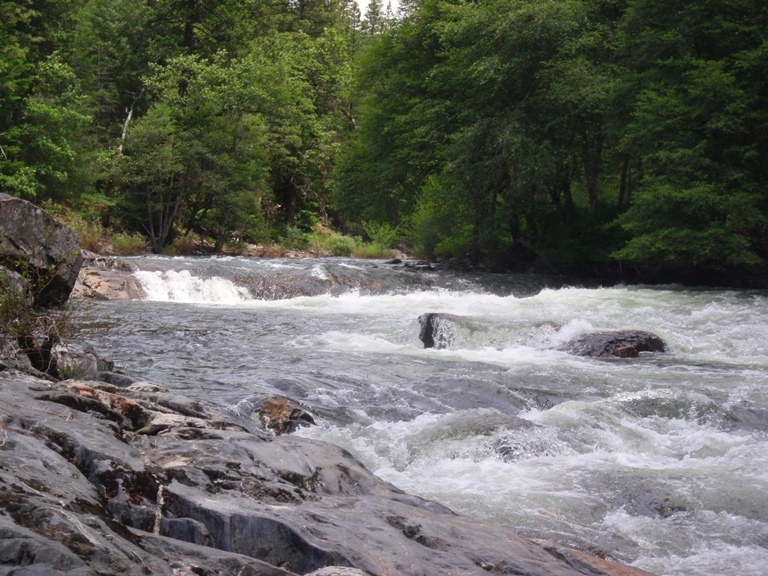 You will cross Bear River (impressive looking) and you are almost there. 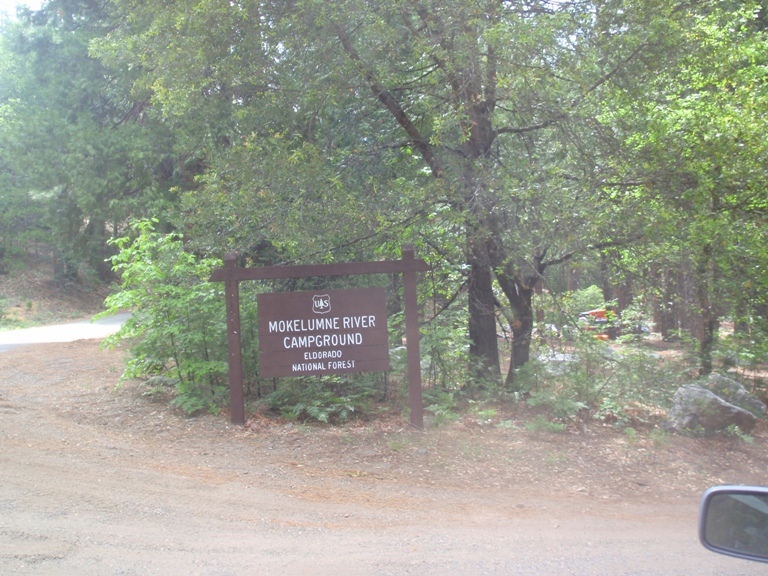 Continue until you see Mokelumne Campground. Put-in there. 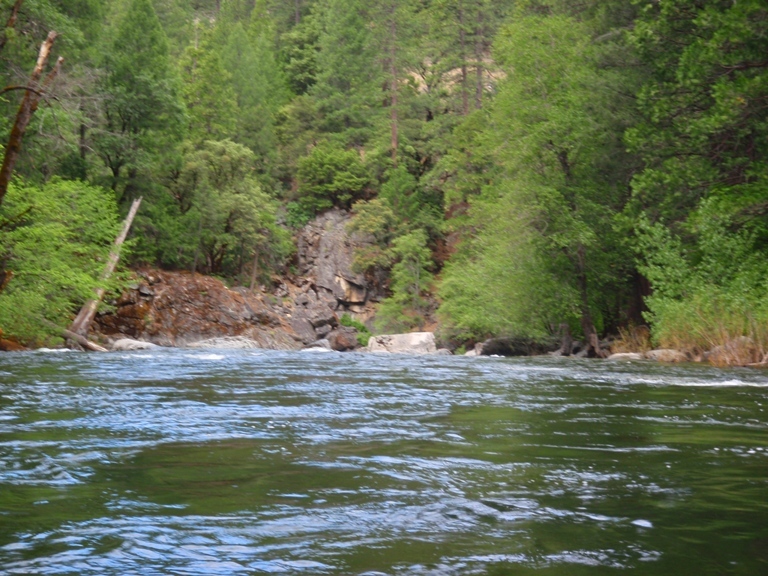 Upriver from the campground is some class V, putting in below Salts Spring Reservoir, 3 miles upriver. I believe it has been run but I don’t know that for a fact. You can also, instead of using the road that parallels the canyon, drive back to highway 88 and continue east until you see Ellis Road just across from something involving Lumber, maybe Lumberyard (didn’t quite understand the ranger). Elise road then leads 8 miles down to the Bear River and the last mile or so of the dirt road. It however takes just as long and is a longer drive. 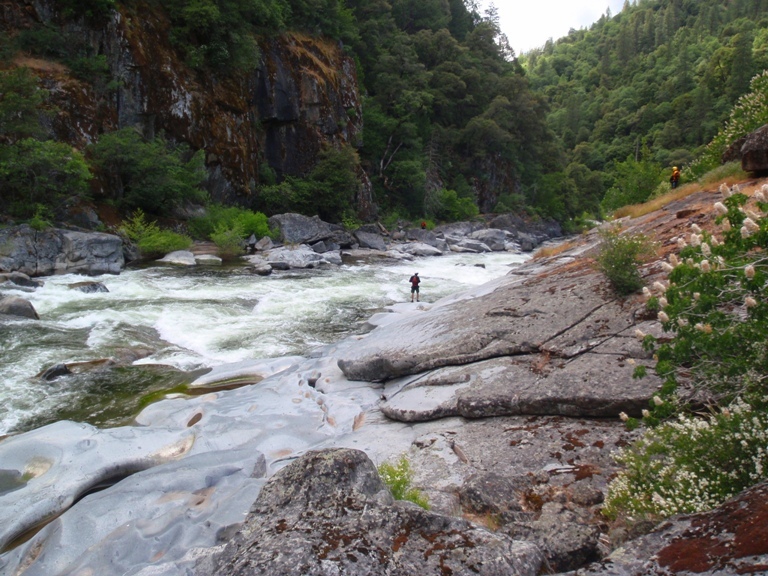 One final note, apparently there is a new official river access just up river from the campground, it would probably be best to use it instead of the campground. Alternate Access (thanks to Katherine Evatt): Another access to the put-in is from Highway 88 to Panther Creek Road, then east on the Tiger Creek dirt/gravel road that runs along the river canyon. 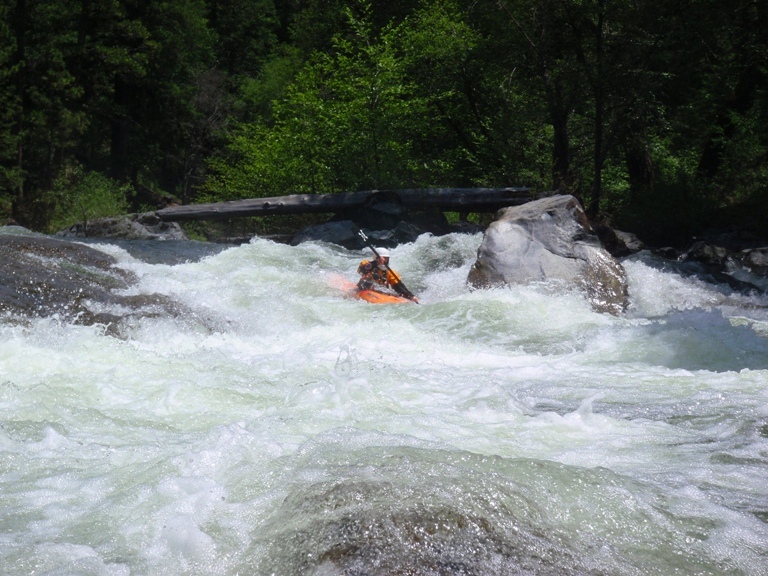 Panther Creek is often accessible when Ellis is still snowed in, and a little faster than driving all the way from the put-in up Tiger Creek Road.